Even as digital media seems to take over our everyday lives, print marketing continues to be successful. From trade show displays to direct mail, businesses across industries use high-quality printed materials to enhance their brand and improve their customer acquisition efforts. Of course, the effectiveness of one does not make the other irrelevant. Print and digital marketing work best when they’re moving in lockstep, coordinated ideally to attract and convert your audience. Given that it takes between six and eight marketing touches to even create a prospect ready to consider buying from you, coordination is crucial. 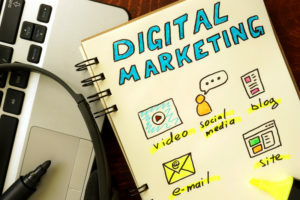 To accomplish that feat, take these 5 steps to combine your print and digital marketing campaigns for maximum success. In any type of marketing, consistency is key. Before you even begin to consider the individual tactics you’ll use to convince your audience, it’s vital to come up with a brand identity. If you don’t, you invite confusion or simply risk your audience not being able to connect your brochure and website as part of the same marketing effort. Of course, you can only accomplish that degree of consistency with effective graphic design. Each of your marketing tactics, from the logo on your social media profile to your trade show display, should not just look professional but also reflect your desired brand identity. The same colors, fonts, styles, and core message should always shine through, regardless of where your audience encounters your brand. Speaking of the message: given the plethora of print and digital marketing tactics available even to small businesses today, it’s tempting to get carried away in the aspects of your product or service you want to promote. On social media, you may tout your expertise and sales success. Meanwhile, a brochure may outline your product features, while a postcard introduces your team. Your materials should not be identical copies of each other. But while your message can be adjusted for the medium in which it appears, it’s also important keep track of your core value proposition. Find your core competency, and make sure that all of your materials—from print to digital—bring home that message. Use your branded social media pages to provide relevant follow-ups for print materials. If a postcard includes a testimonial, include a video of that testimonial online. Anticipate frequently searched-for keywords and phrases. Your brochure might tout your product’s benefits compared to your competitors, in which case you should aim to increase your search engine rankings for keywords related to product comparisons. In addition, you can use landing pages on your website to build your mailing list. Allow your audience to sign up in exchange for rewards, such as coupon books or loyalty cards, which increases the number of potential customers your next promotion will reach. You cannot (and should not) rely on your audience to take the step from receiving printed materials to engaging with your brand online on their own—but you can provide them with natural calls to action to do just that. For instance, all of your materials, from brochures to magnets, should have social media icons that show your audience just where they can find you online. A link to your website also makes sense, as do QR codes for the increasing number of consumers who have a smartphone nearby. The goal is to move your audience from passive readers into active users who engage with you on social media and your website. Once you accomplish that, the chances of those users converting to customers multiplies. Finally, if your marketing efforts include trade show booths or other types of in-person print displays, consider linking these displays directly to your digital platforms. For instance, you can offer incentives at your booth, such as promotional materials, for your audience to start following you. The goal is to connect to your audience online while they’re engaging with your brand offline. The above four steps should help you improve the link and connection between your print and digital materials in theory. Of course, you still have to figure out whether that intended connection actually occurs. The best way to do that is to track your media crossover. Through tracking URLs, for example, you can determine the exact traffic to your website from your various printed materials. Hide these tracking URLs in QR codes or personalized URLs, and you can extract additional information without having to include an unruly string of characters on your postcards or brochures. In reverse, you can offer personalized incentives and discounts for audiences who purchase from you after engaging with your brand on social media. Anytime the discount coupon is used, you can analyze whether it originally came from one of your mailing lists to determine whether your combination of print and digital marketing was responsible for the sale. To sustainably grow your business and brand, you cannot focus only on print or digital tactics. A combination of both is significantly more effective, if you know how to integrate that combination for maximum success. Build a consistent strategy and create a consistent marketing infrastructure to optimize your efforts. Then, track your results to determine success and make adjustments as needed. Over time, your business will grow and your marketing success will improve.